I’ve always had a fascination with sound. In particular, the effects that sound can have on an individual or group of people. CNN did a health study on how singing together can have a physical impact within the human body. The study found that when a choir begins to sing together, their hearts synchronize as well! There is something quite extraordinary in this one small example of how powerful sound can be. Melody, harmony, lyrics, and motifs – when placed together these sounds have the potential to form a beautiful masterpiece that can impact people in incredible and mysterious ways. Over the last few years, part of my time has been spent as a music producer. One the most challenging realities is visualizing what a simple lyric and melody could become with the beauty of instrumentation around it. As a producer, my role is to not only think through what is in the artist’s heart for each song, but to also consider the musical context of how that message will be expressed and captured artistically. How long do you have to get to this finish line? There are those artists who will spend months, years, sometimes decades, waiting to release their art into the world. I wish this didn’t have to do with their perfectionism, OCD tendencies, or the fear of being misunderstood, but most of the time it does. In the time that they’ve created something and sat on it, they’ve moved on to a reality that looks different than it did at the original inception, and as a result they never release anything because it somehow seems less relevant at that point. This process is cyclical and paralyzing. Perfectionism is crude to the artist and rips innocence from the inner child. True art is a snapshot in time. Know that the art you’re creating today is connected to where your soul is today. An early draft may not be the most balanced or excellent, but it certainly is the purest. While I’m an advocate for moving beyond the first draft, we have to be discerning enough to know when to stop, particularly in a culture that loves the glossy highlight reel. (NOTE: I’m speaking to aesthetic treatment and not lyric and melody.) The public always has an opinion, so to release it is to subject it to judgment. If you truly have something to say, get over it and go for it. There’s no safer place to express your ideas as a songwriter, singer, or artist than in the context of family. When “family” happens around the process of recording and producing, it is an invitation for the Divine to breathe. There is something beautiful about doing what you love with people you love. Most people settle for one of these two realities, but the truth is you can have both. I’ve been in sterile studio environments where the goal has been to see how much output can be generated in a day without considering the space to simply be known during the process. Choose to create while being known. The musicians I use on every project are my friends, I have them play because their character and craft are oriented toward wanting to follow Jesus well. I love what each of them contributes to the whole process, and reigning all of those singular ideas into collaborative energy and focus is heavy lifting, but quite fun. With most things in life, where there is no pain, there is no gain. If you want to increase your capacity, you must allow it to be stretched. 100% of the time, I know that I’m not the best in the room. So much of why I love producing is based upon what I can learn and draw out of others who are better at their craft than I will ever be. When you’re surrounded by this kind of company, you either rise to the occasion, or fail and try again. Through repetition, multiple takes, and logging hours in the details of certain musical parts, you find you have embodied the song in a much deeper way. And you have refined your craft in the process. So, if you’re a worship artist, musician, or producer, consider these things as you engage in your creative process. Much of our school curriculum focuses on the technique of songwriting. We emphasize this because we believe that God is raising up men and women who have influence in the communities and Churches they’re a part of. A natural outflow of writing songs isn’t to just keep them stored on your voice memo app, but rather to inspire, challenge, awaken, and disturb the status quo of the songs we sing and introduce them to the people you have been called to lead. I think the focus in worship culture is shifting from leading other people’s well-known songs to leading the songs coming from within local communities. 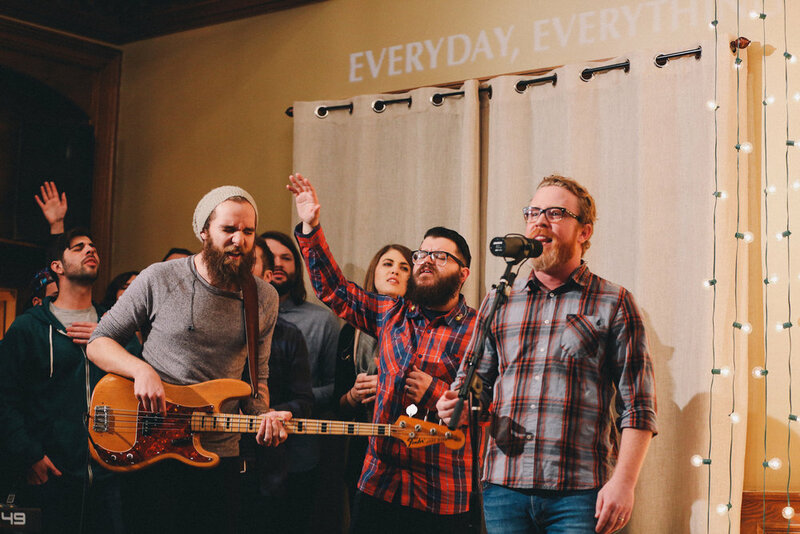 There is certainly value in singing songs that are familiar, fresh, and well-known, but the worship that comes from local artists leaning in to what God is doing in their community is a beautiful expression of the Kingdom at work that the Church has been missing for too long. David Walker serves as a 10,000 Fathers Lead Team member, coach, and producer.